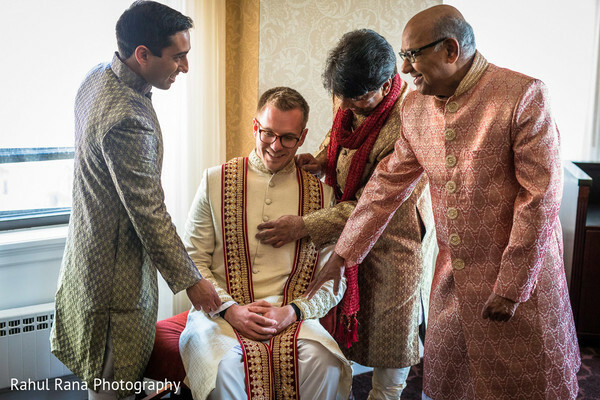 Today we discover the charming wedding of Hajerah and Kyle, these cute pair tied the knot in the windy city at The Drake Hotel. A blissful preamble night introduced both sides’ families to the wedding celebrations and prepared them for what was about to come! 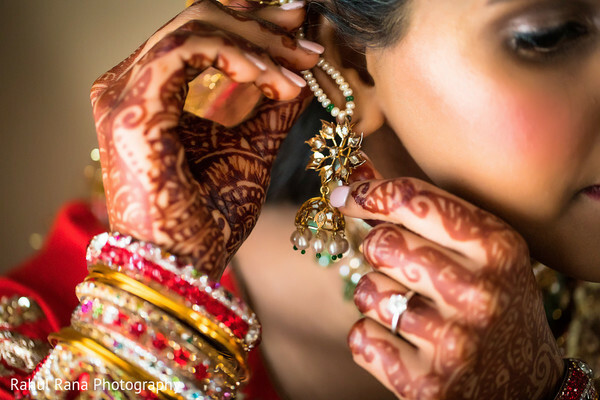 Fast forward, on one of the biggest days of their life Rahul Rana Photography initiated the day with the newlyweds photographing the lovebirds during their wedding prep rituals. 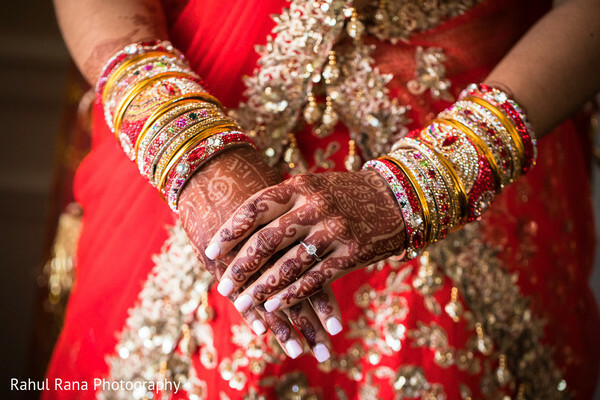 Maharani Hajerah slipped into a heavily embroidered red bridal lehenga with a dreamy dupatta, equally beautiful as the dark mehndi design Unnati'Z Art created on her perfect manicured hands. These two received many blessings and good wishes from their closest ones as they prepared for their big moment and later had a lovely outdoor family photo session. 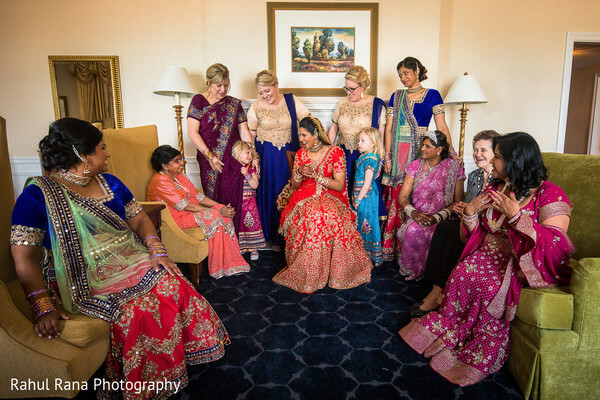 We have all the insanely beautiful wedding portraits in our full gallery! My husband and I went to the same medical school but were more acquaintances until our 3rd year medical trip to Kenya. We were there volunteering in rural health clinics, which meant traveling by bus for multiple hours a day to our sites. Kyle and I would sit next to each other on these trips and spend the whole day talking. Despite such long stretches together, we never ran out of things to say. After our 12 hour days, we’d have a group dinner. Kyle, knowing I loved to drink tea, and though exhausted, would bring me a cup at the end of dinner without me asking every evening. Between the great conversation and his thoughtful actions, I knew I had met someone special… and he’s still the sweetest person I know! We were on vacation, spending a few days in Florida. We were making the most of our days as at the time we were long distance and it would be a while before we’d be able to see each other again. The day of the proposal had a lot of happiness from the get-go—I learned I had matched to a residency program, we had gone on a nice jog, eaten lunch, and spent the day enjoying the sun. It was nice to just be able to do simple things together after being apart for so long. At one point, I even told my sisters on the phone that I was having the perfect day! Well according to Kyle, I kept saying that, which is what prompted him to realize that day was THE day. We were walking out of the hotel to dinner and Kyle got down on one knee and proposed. To be honest, I don’t even remember everything he said because I was so surprised. I just started laughing and said yes. He told me later he was just too excited and couldn't wait until the end of the evening. I am from Chicago and it is a meaningful place to me, as my entire extended family is here. I knew I wanted to incorporate that into my wedding. With that in mind, The Drake was the perfect venue as the hotel very much embodied the Classic Chicago feel we were going for. All the staff was wonderful to work with! 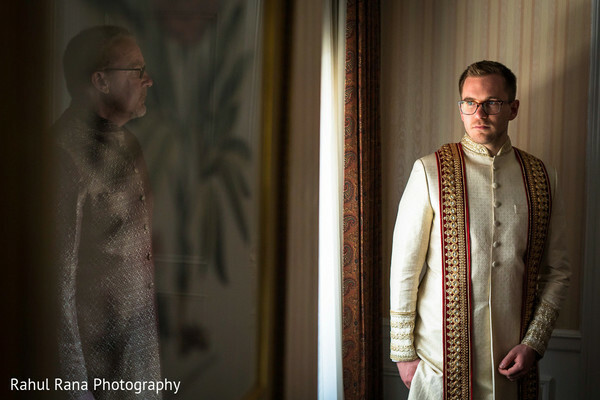 It was important to us that our wedding reflected our inter-cultural relationship, which my venue was very receptive towards. I worked closely with the hotel coordinator to identify which vendors could help us capture the theme and the look of the two parties we were throwing there. I’m really happy with how it turned out. I went to India to get my lengha. 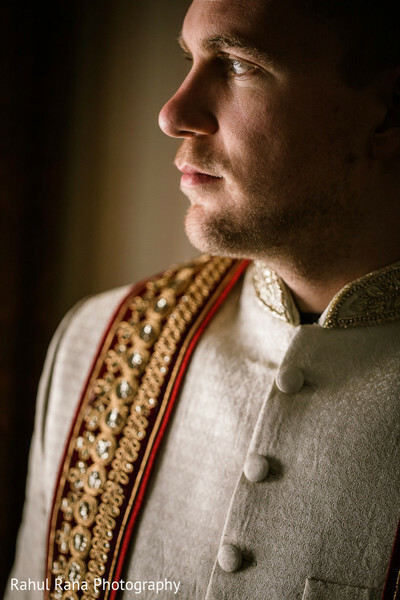 During the religious ceremony I had worn my mother’s wedding outfit, which was very special, but for my reception, I wanted something unique. 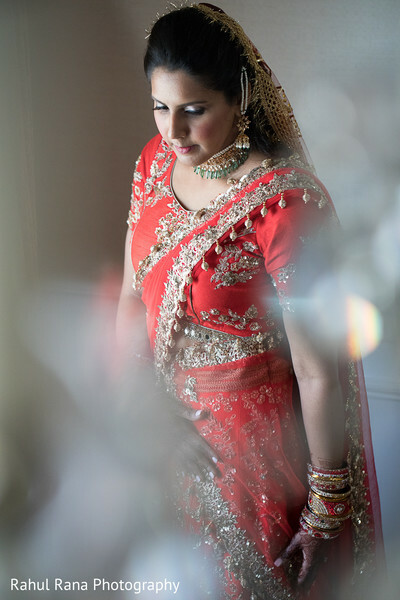 I knew I wanted something bright red; red because of Indian tradition and bright to reflect my excitement on my wedding day. Picking out my bridal lengha was an experience I’ll never forget. My sister and mom came shopping with me and it had been over a decade since we’d all been on a visit to India together...what a special reason to be there! We went to many stores trying to find the perfect dress, it was both overwhelming but so fun. When I finally tried on the right lengha, I just knew. It actually was creating a guest list and designing the invitations. I am from Chicago, went to college in Boston, and did medical School in Colorado. My husband is from Minnesota and also went to medical school in Colorado. In that time we have made many special relationships in each area we have lived. There is just something uniquely special about being able to bring all of your friends and family from all across the country to celebrate with you in one place. I think that thought is what made something that could have been a stressful part of the process my favorite! I think my guests enjoyed that our wedding was in the heart of Chicago. They were able to enjoy the city and come to the wedding with very little stress. Many of our friends and family members got a chance to explore the city before celebrating in the evening. I was also told they loved the music! We had traditional Indian singers at the start of the evening when everyone was getting settled in for the meal, and then afterward our DJ did a great job of bringing everyone to the dance floor. Weddings are an emotional blur, the same was true for me and Kyle; however, after we had taken our wedding photos and were heading to our reception Kyle and I had the opportunity to rest for a few minutes in our wedding suite. Being there just the two of us for those few minutes gave us a chance to really take in how special this day was and how in love with each other we were. It’s a moment that I will remember forever. The night before my wedding we had a Dohlki. It was Indian street fair themed and that meant it was full of color and energy. My cousins and friends choreographed dances for me and we got down while enjoying wonderful street-style food! There was a henna artist for people to get their hands done and fun souvenir bangles, and of course, amazing music. I think the best advice I could give is to make sure to pay attention to the little details on your wedding day. There is so much going on that it can get a little chaotic, but you put so much time and effort into making your day perfect, so you deserve to take all the details in, no matter how small. My wedding cake was gorgeous. It was done by Cake Chicago and was a great focal point during my reception. My jewelry was traditional from my grandmother and knowing that I wore her jewelry is still very meaningful to me. I think little details like that really make the day extra special. 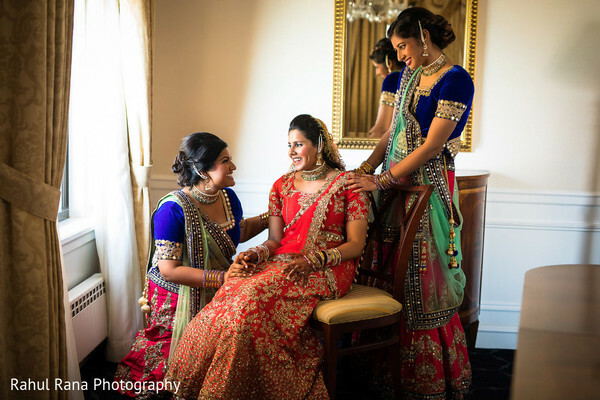 Peek through the most beautiful fusion wedding ceremony in Chicago in our next feature! 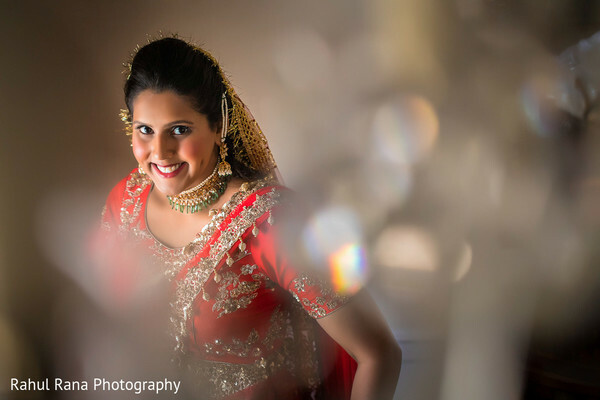 Rahul Rana Photography, Creative Sounds and Windy City Limousine & Bus are members of the Platinum Guide. Love what you see? Explore their portfolios.